The latest addition to the L-evolution collection features a flyback split-seconds chronograph mechanism and a large date. 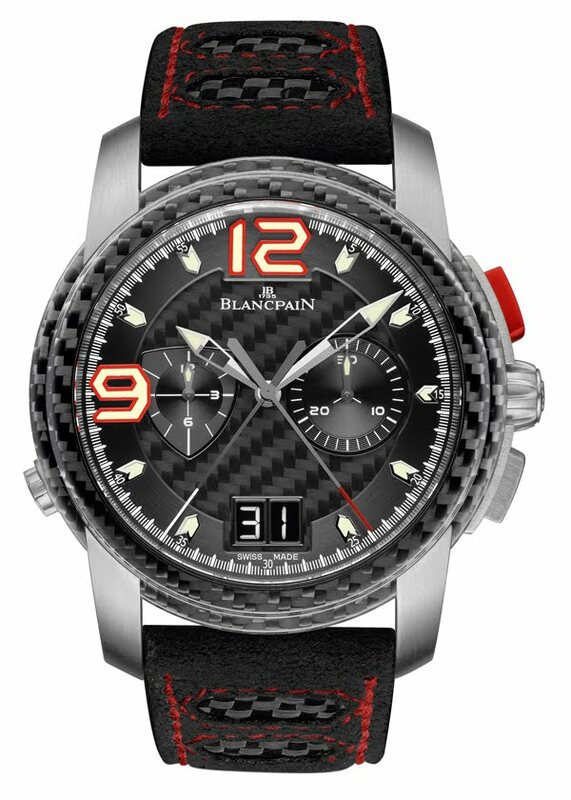 This watch, combining carbone fibre and cutting-edge technology, reflects Blancpain’s strong commitment in GT racing. 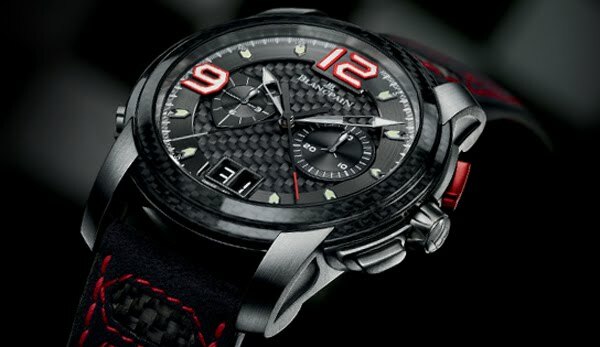 Having decided to adopt such an extreme attitude, Blancpain naturally chose carbon fibre in creating this timepiece. Its lightness and sturdiness, combined with its aesthetic appeal, provide a wealth of development options. 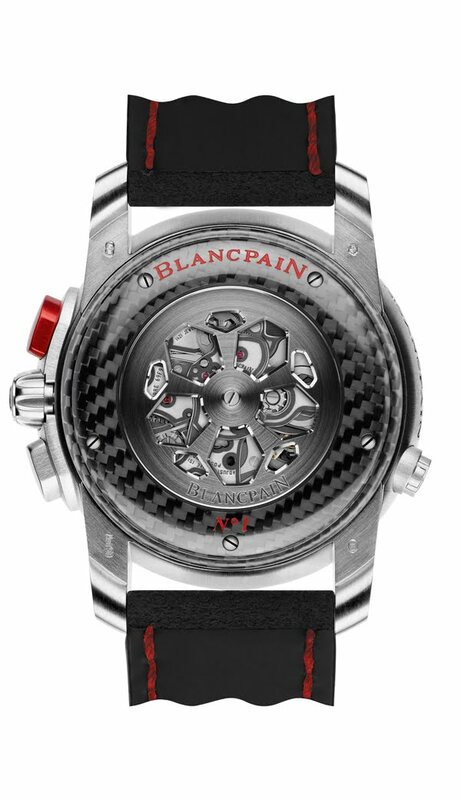 This high-tech material was used to create certain watch components: the carbon fibre bezel, caseback and dial represent significant technical feats, reflecting Blancpain’s characteristic innovative strength. To accentuate this sporting personality, the large date display features a digital font; red accents punctuate the black background; the 8 o’clock pusher echoes the shape of a fuel-cap; and the 9 o’clock counter that of an insignia. At the heart of this new model beats Calibre 69F9 with its 409 parts including 44 jewels, ensuring a 40-hour power reserve. It is equipped with a column wheel that guarantees precise pusher control, as well as a vertical coupling-clutch that avoids any unwanted jerking of the hand when the chronograph is activated. This movement combines a flyback split-second chronograph mechanism with a large twin-aperture date display. The split-second chronograph function is a major horological complication that enables readings of “split” or intermediate times thanks to a so-called split-second (rattrapante or “catch-up” in French) hand that is superimposed on the chronograph sweep seconds hand. When the split-second function is activated via the pusher at 8 o’clock, the hand stops to enable reading of a split time, while the sweep seconds hand continues running. A second press on the pusher enables the split-second hand to “catch up with” the sweep seconds hand. 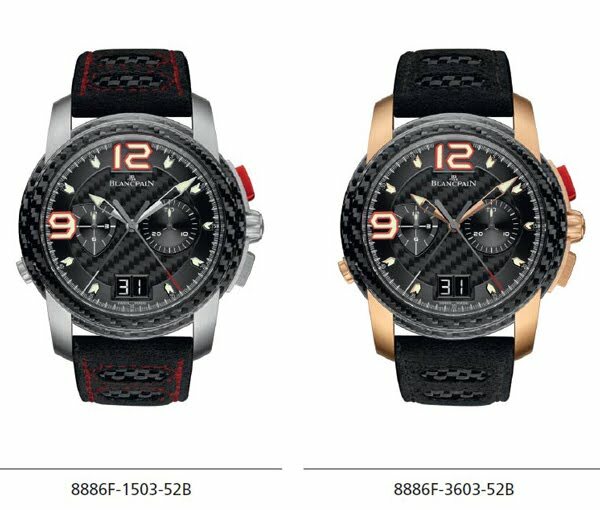 The flyback function, enabling reset and instant restart of the chronograph, is activated by pressing the pusher at 4 o’clock. The sapphire crystal reveals fascinating glimpses of this movement with its unique decoration. Numerous stages were involved in achieving this result. The parts have been coated with a beadblasted two-tone material (5N red gold-plated or rhodiumed depending on the finish); while the straight graining on the NAC bridges features the anthracite appearance characteristic of this treatment. The overstitched strap in black alcantara features carbon inserts reminiscent of the latest breakthrough developments in the field of racing cars, while the carbon folding clasp adds an ultimate touch of refined detailing.